10th Annual Pagan Fest is May 7, 2011 in Berkeley. 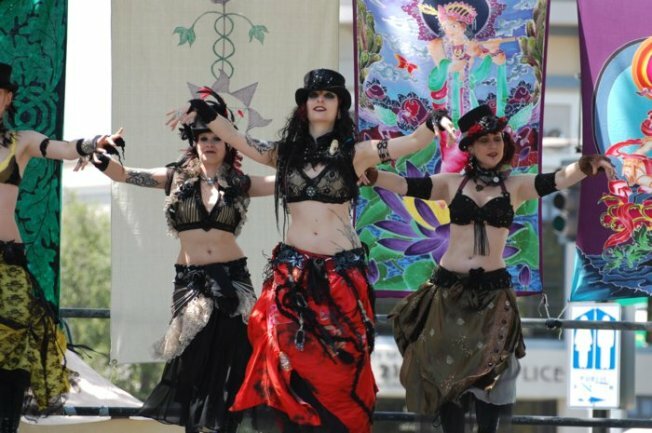 The 10th Annual Pagan Festival will be held on Saturday, May 7, 2011, at the Civic Center Park in Berkeley. The theme of this year's fest is "10 years of Pagan Pride." Featured at the festival include an Interfaith Ritual; Community Altars; a Disaster Preparedness Pavilion; a Temple of Change; Druid Story Telling; Author’s Circle; Children’s Craft Area; Vendors; Local Organizational Information; and Prizes for Best Float and Best Costume. Stage Performances and Speakers include Beltane’s Fire; The Mano Cherga Band; Hobbyhorse; Amelia Hogan; Circle of Dionysos; Copperwoman; Kettlefish (of Land of the Blind); Swoon; Pepper Alexandria's Ghawazee; Sirens in Sanity; Goddess Force; Morpheus Ravenna; joi wolfwomyn; M. Macha Nightmare, Diana Paxson, Don Frew. The festival starts at 10:00 a.m. and runs til 5:30 p.m. More info can be found at their website.